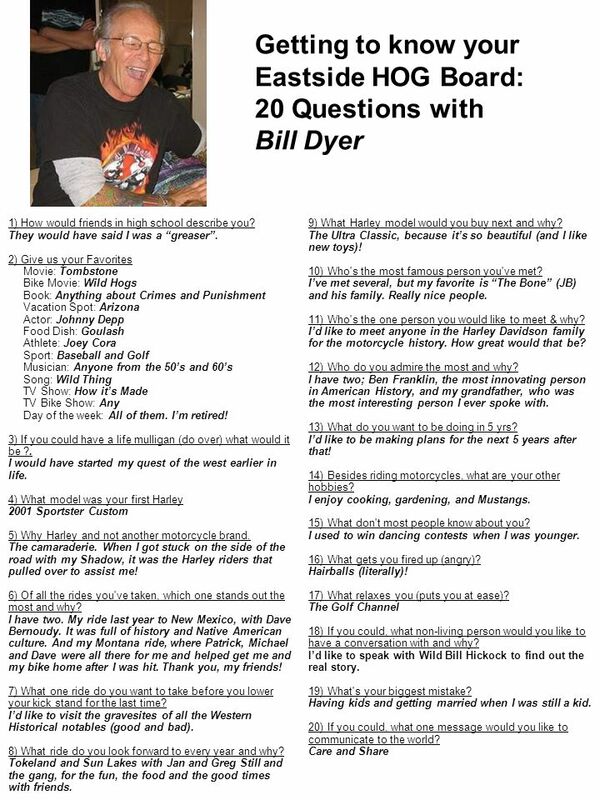 Getting to know your Eastside HOG Board: 20 Questions with Bill Dyer 9) What Harley model would you buy next and why? The Ultra Classic, because its so. Download ppt "Getting to know your Eastside HOG Board: 20 Questions with Bill Dyer 9) What Harley model would you buy next and why? The Ultra Classic, because its so." Getting to know your Eastside HOG Board: 20 Questions with Jay Munro 10) Who's the most famous person you've met? Not sure, a few - GH Bush (when he was. Getting to know your Eastside HOG Board: 20 Questions with Rich Moothart. 1) Rich, give us some personal information about yourself: What president was. 5) Why Harley and not another motorcycle brand. My dad had Harleys and Indians so that was an influence on me growing up. I owned other brands, mostly. 6) Of all the rides you've taken, which one stands out the most and why? I have two, One is the 2005 WA State Rally, it was my very first long group ride. Getting to know your Eastside HOG Board: 20 Questions with Lisa and Dan Hallett 1) Give us some personal information about yourself: What president was. Getting to know your Eastside HOG Board: 20 Questions with Sheree Collins 7) What one ride do you want to take before you lower your kick stand for the. Getting to know your Eastside HOG Board: 20 Questions with Mike Taylor 9) What Harley model would you buy next and why? I would love to have a CVO Ultra. Getting to know your Eastside HOG Board: 20 Questions with Ken Lee 11) Who's the one person you would like to meet & why? Osama Bin Laden, so I could help. 1.How long have you been married? 2.What is the best part about being married? 3.What is the most challenging part of being married? 4.How do you resolve.